Iceland's defences consist of the Icelandic Coast Guard, which patrols Icelandic waters and airspace, and other services such as the National Commissioner's National Security and Special Forces Units. Iceland is however the only NATO member which maintains no standing army. The Coast Guard consists of three ships and four aircraft and armed with small arms, naval artillery, and Air Defence weaponry. The Coast Guard also maintains the Iceland Air Defence System, formerly part of the disestablished Defence Agency, which conducts ground surveillance of Iceland's air space. Units subordinated to the National Commissioner also take part in Iceland's defences. Foremost of these are the National Security Unit, which handles intelligence operations and the special unit Víkingasveitin, a highly trained and equipped counter terrorism unit which is part of the National Police force. Additionally there is a Crisis Response Unit (ICRU), operated by the Ministry for Foreign Affairs, which is a small peacekeeping force that has been deployed internationally, since 2008. This unit also has an unarmed component. There is a treaty with the United States, regarding the defense of Iceland, which until 2006 maintained the Naval Air Station Keflavik. The base, now operated by the Icelandic Coast Guard, has been regularly visited by the US military and other allied NATO members. In 2017 the United States announced its interest in renovating a hangar, in order to fit Boeing P-8 Poseidon ASW aircraft inside, at the air base. There are also agreements about military and other security operations with Norway, Denmark and other NATO countries. Iceland holds the annual NATO exercises entitled Northern Viking. The most recent exercises were held in 2011, as well as the EOD exercise "Northern Challenge". In 1997 Iceland hosted its first Partnership for Peace (PfP) exercise, "Cooperative Safeguard", which is the only multilateral PfP exercise so far in which Russia has participated. Another major PfP exercise was hosted in 2000. Iceland has also contributed ICRU peacekeepers to SFOR, KFOR and ISAF. In the period from the settlement of Iceland, in the 870s, until it became part of the realm of the Norwegian King, military defences of Iceland consisted of multiple chieftains (Goðar) and their free followers (þingmenn, bændur or liðsmenn) organised according to the standard Nordic military doctrine of the time in expeditionary armies such as the leiðangr. These armies were divided into units according to the quality of the warriors and by birth. At the end of this period the number of chieftains had diminished and their power had grown, to the detriment of their followers. This resulted in a long and bloody civil war known as Age of the Sturlungs. A typical battle involved fewer than 1000 men. Amphibious operations were an important part of warfare in Iceland in this period, especially in the Westfjords, but large naval engagements were rare. The largest such engagement, known as Flóabardagi, involved a few dozen ships in Húnaflói (bay). In the decades before the Napoleonic wars, the few hundred militiamen in the southwest of Iceland were mainly equipped with rusty and mostly obsolete medieval weaponry, including 16th century halberds. When English raiders arrived in 1808, after sinking or capturing most of the Danish-Norwegian Navy in the Battle of Copenhagen, the amount of gunpowder in Iceland was so small that the governor of Iceland, Count Trampe, could not offer any resistance. In 1855, the Icelandic Army was re-established by Andreas August von Kohl, the sheriff in Vestmannaeyjar. In 1856, the king provided 180 rixdollars to buy guns, and a further 200 rixdollars the following year. The sheriff became the Captain of the new army, which become known as Herfylkingin, "The Battalion". In 1860 von Kohl died, and Pétur Bjarnasen took over command. 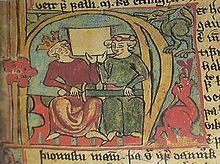 Nine years later Bjarnasen died without appointing a successor, and the army fell into disarray. Agnar Kofoed Hansen training his officers in the arts of war in 1940. In 1918, Iceland regained sovereignty as a separate kingdom under the Danish king. Iceland established a Coast Guard shortly afterwards, but it was financially impossible to establish a standing army. The government hoped that a permanent neutrality would shield the country from invasion. But at the onset of Second World War, the government was concerned about a possible invasion, and decided to expand the Icelandic National Police (Ríkislögreglan) and its reserves into a military unit. Chief Commissioner of Police Agnar Kofoed Hansen had been trained in the Danish Army and he moved to train his officers. Weapons and uniforms were acquired, and they practised rifleshooting and military tactics near Laugarvatn. Hansen barely managed to train his 60 officers before the United Kingdom's invasion of Iceland on 10 May 1940. The next planned step towards strengthening the army was to train the 300 strong reserve forces, but this was prevented by the invasion. During the Second World War, the United States took over the defense of Iceland from the British, and this arrangement continued well after the war, eventually codified in the Agreed Minute. In 1949 Iceland was a founding member of NATO, and it was the sole member that did not have a standing army, joining on the condition that it would not be expected to establish one. However, its strategic geographic position in the Atlantic made it an invaluable member. Expansion of forces by Iceland was therefore concentrated primarily in the Icelandic Coast Guard, which saw action in a series of confrontations with British fishing vessels and Royal Navy warships known as the Cod Wars. The Iceland Defense Force (IDF) was a military command of the United States Armed Forces from 1951 to 2006. The IDF, created at the request of NATO, came into existence when the United States signed an agreement to provide for the defense of Iceland. The IDF also consisted of civilian Icelanders and military members of other NATO nations. The IDF was downsized after the end of the Cold War and the U.S. Air Force maintained four to six interceptor aircraft at the Naval Air Station Keflavik, until they were withdrawn on 30 September 2006. Since May 2008, NATO nations have periodically deployed fighters to patrol Icelandic airspace under the Icelandic Air Policing mission. Icelandic Coast Guard vessels. Týr in the center. Shortly after Iceland reclaimed its sovereignty in 1918, the Icelandic Coast Guard was founded. Its first vessel, a former Danish research vessel, was armed with a 57 mm cannon. The Coast Guard is responsible for protecting Iceland's sovereignty and vital interests including the most valuable natural resource—its fishing areas—as well as providing security, search, and rescue services to Iceland's fishing fleet. In 1952, 1958, 1972, and 1975, the government progressively expanded Iceland's exclusive economic zone to 4, 12, 50 and then 200 nautical miles (370 km). This led to a conflict with the United Kingdom, among other states, known as the "Cod Wars". The Icelandic Coast Guard and the Royal Navy confronted each other on several occasions during these years. Although few rounds were fired, there were many intense moments. Today the Coast Guard remains Iceland's premier fighting force equipped with armed patrol vessels and aircraft and partaking in peacekeeping operations in foreign lands. The Coast Guard has four vessels and four aircraft (one fixed wing and three helicopters) at their disposal. The Iceland Air Defence System or Íslenska Loftvarnarkerfið was founded in 1987, and operates four radar complexes, a software and support facility and a command and report centre. It is a part of the Coast Guard. Iceland's NATO allies also regularly deploy fighter aircraft to patrol the country's airspace as part of the Icelandic Air Policing mission. The Icelandic Crisis Response Unit (ICRU) (or Íslenska friðargæslan or "The Icelandic Peacekeeping Guard") is an expeditionary peacekeeping force maintained by the Ministry for Foreign Affairs. It is manned by personnel from Iceland's other services, armed or not, including the National Police, Coast Guard, Emergency Services and Health-care system. Because of the military nature of most of the ICRU's assignments, all of its members receive basic infantry combat training. This training has often been conducted by the Norwegian Army, but the Coast Guard and the Special forces are also assigned to train the ICRU. Most of the ICRU's camouflage and weaponry is procured from abroad, with some indigenous development. Some arms and uniforms are also borrowed from the Norwegian Defence Forces. The formation and employment of the unit has met controversy in Iceland, especially by people to the left on the political scale. In October 2004, three ICRU soldiers were wounded in a suicide bombing in Kabul. The incident led to tough questioning of the group's commander, Colonel Halli Sigurðsson, focusing on his conduct . Later the command was passed to Lt. Colonel Gardar Forberg followed by Colonel Lárus Atlason. In 2008, the portion of uniformed ICRU deployed personnel still armed for self-defense returned their weapons and changed to civilian clothing. The policy since 2008 is that, unless under special circumstances, ICRU personnel do not wear uniforms or carry weapons. ^ "Lög um breytingu á varnarmálalögum, nr. 34/2008". Retrieved 23 October 2014. ^ "Varnarmálalög". Retrieved 23 October 2014. ^ "Landhelgisgæsla Íslands Hlutverk". Archived from the original on 2014-07-06. Retrieved 23 October 2014. ^ "NATO Air Policing". Retrieved 23 October 2014. ^ "U.S. military returns to Iceland". ^ Snow, Shawn (17 December 2017). "US plans $200 million buildup of European air bases flanking Russia". ^ "A press release from the Norwegian Ministry of Foreign Affairs". Retrieved 23 October 2014. ^ "An English translation of the Norwegian-Icelandic MoU at the website of the Norwegian Ministry of Foreign Affairs" (PDF). ^ "Norway Post: Norway and Iceland to sign defence agreement". Archived from the original on 29 September 2007. Retrieved 23 October 2014. ^ "Danmarks Radio". Retrieved 23 October 2014. ^ "A press release from the Icelandic Coast Guard". Retrieved 23 October 2014. ^ a b "Air Policing". NATO Air Command Operations. Retrieved 2 October 2010. ^ John Pike. "Iceland". Retrieved 23 October 2014. Birgir Loftsson, Hernaðarsaga Íslands : 1170–1581, Pjaxi. Reykjavík. 2006. Þór Whitehead, The Ally who came in from the cold : a survey of Icelandic Foreign Policy 1946–1956, Centre for International Studies. University of Iceland Press. Reykjavík. 1998. Wikimedia Commons has media related to Military of Iceland. The French Armed Forces encompass the Army, the Navy, the Air Force, the National Guard and the Gendarmerie of the French Republic. The President of France heads the armed forces as chef des armées. The Defense Forces of Georgia, known as the Georgian Armed Forces until December 2018, are the combined military forces of Georgia, tasked with the defense of the nation’s independence, sovereignty, and territorial integrity. They consist of the Land Force, Air Force, National Guard, and Special Operations Forces. The Defense Forces are under overall leadership of the Minister of Defense of Georgia and directly headed by the Chief of Defense Forces. A coast guard or coastguard, is a maritime security organization of a particular country. The term implies widely different responsibilities in different countries, from being a heavily armed military force with customs and security duties to being a volunteer organization tasked with search and rescue functions and lacking any law enforcement powers. However, a typical coast guard's functions are distinct from typical functions of both the navy and a transportation police. The Iceland Defense Force (IDF) was a military command of the United States Armed Forces from 1951 to 2006. The IDF, created at the request of NATO, came into existence when the United States signed an agreement to provide for the defense of Iceland, which has only limited defense forces. The Norwegian Armed Forces is the military organisation responsible for the defence of Norway. 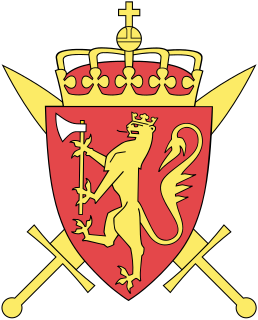 It consists of four branches, the Norwegian Army, the Royal Norwegian Navy, which includes the Coast Guard, the Royal Norwegian Air Force, and the Home Guard, as well as several joint departments. The Icelandic Coast Guard is the service responsible for Iceland's coastal defense and maritime and aeronautical search and rescue. Its origins can be traced to 1859, when the corvette Ørnen started patrolling Icelandic waters. In 1906, Iceland's first purposely built guard-ship, Islands Falk, began operation. Iceland's own defense of its territorial waters began around 1920 and the Icelandic Coast Guard was formally founded on 1 July 1926. The first cannon was put on the trawler Thor in 1924 and on 23 June 1926 the first ship built for the Coast Guard, named Óðinn, arrived in Iceland. Three years later, on 14 July 1929 the coastal defence ship Ægir was added to the Coast Guard fleet. The 85th Group is an inactive United States Air Force organization. Its last assignment was with United States Air Forces in Europe at Naval Air Station Keflavik, Iceland, assigned as a unit of the 48th Fighter Wing whose home station is at RAF Lakenheath, UK. It was inactivated on 28 June 2006. Naval Air Station Keflavik (NASKEF) is a U.S. Navy base at Keflavík International Airport, Iceland. It is located on the Reykjanes peninsula on the south-west portion of the island. Built during World War II by the United States Army as part of its mission to maintain the defense of Iceland and secure northern Atlantic air routes, it served to ferry personnel, equipment, and supplies to Europe. Intended as a temporary wartime base under an agreement with Iceland and the British, US forces withdrew by 1947, but returned in 1951 as the Iceland Defense Force, now operating a NATO base. NASKEF was closed on 8 September 2006 and its facilities taken over by the Icelandic Defence Agency as their primary base until 1 January 2011 when the Agency was abolished and the base handed over to the Icelandic Coast Guard which has since then operated the base. The base is regularly visited by the American military and other NATO allies, for military exercises, NATO Air Policing and other tasks. In 2017 the United States announced its intention to modify the largest hangar on the airbase in order to house the new Boeing P-8 Poseidon ASW aircraft being introduced. The Indian Armed Forces are the military forces of the Republic of India. It consists of three professional uniformed services: the Indian Army, Indian Navy, and Indian Air Force. Additionally, the Indian Armed Forces are supported by the Indian Coast Guard and paramilitary organisations and various inter-service commands and institutions such as the Strategic Forces Command, the Andaman and Nicobar Command and the Integrated Defence Staff. The President of India is the Supreme Commander of the Indian Armed Forces. The Indian Armed Forces are under the management of the Ministry of Defence (MoD) of the Government of India. With strength of over 1.4 million active personnel, it is the world's 2nd largest military force and has the world's largest volunteer army.